← How about a little update? I have been told I need to blog this story …….. it would appear I have been holding out on you. Right before the 4th of July, I was listening to some foodie podcast where big name chefs were being interviewed. What is the secret to the perfect hamburger? Unanimously they all answered the secret lays (lie, lay… gah! I can never get it right) in the fat content of the meat. Thirty percent is the goal and one chef went onto say that grinding it yourself is ideal. Buy a brisket and grind it yourself. He said it was the difference between buying your cheese pre-grated or having fresh grated on your pasta. Well, once you start invoking cheese, I start listening. Kinda like the dogs that way. At first I was going to use my food processor, but then I remembered that I have two old timey meat grinders. One was a little too old timey, but the other was brand new, never used in the box. My mother used to use one to make ham salad when we were growing up. That stuff was delicious. The first big challenge was finding a surface to clamp it on. My kitchen table is too thick, but Boar came to the rescue and got me all set with clamping the grinder to a cutting board and then clamping the entire thing to the kitchen table. per usual, Boar ends up with a starring role in this story. After the clamping questions, Boar goes about his business making sure the grill had enough gas etc. The company would be arriving in about an hour or so. So now I take over, and begin putting the brisket into the hopper. Without thinking, I crank the handle toward myself. That brisket squirted blood at me like a grapefruit squirts juice. gross. The dogs go nuts. They are always underfoot in the kitchen hoping for some kind of mishap. This is by far the best thing I have ever done. No matter how many eggs I drop on the floor, gobs of peanut butter I dole out, grinding meat has now shot to the top of their little canine charts. Did I mention that I am wearing a white shirt? Miraculously none of the blood has gotten onto it – I still can’t figure out how that happened. Since I don’t have any aprons, I pull off the shirt and commence meat grinding in my bra and pants. (this is not an attractive look as you might think). Boar chooses this moment to come back through the kitchen and he goes almost as nuts as the dogs. oh the panting, the panting! He sees right away that by cranking the handle away from you, you minimize the bloodshed. For his discovery, he was awarded all future meat grinding duties. ps. all agreed that the burgers were delicious! And here I thought the secret was to having lil pugs watching you diligently ,,,,,,, the secret of the stare! I’ve been telling this story to everyone since camp. Definitely my favorite meat grinding story. Is he smiling in that picture because he likes the grinding or because he has ground??? …and you two, with the house to yourselves again!! Oh, Ann. I’ve missed your stories! LOL! Too funny. You need to post more often. Oh, this was so funny. 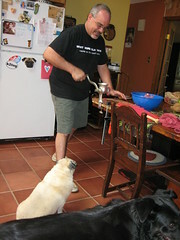 My dogs so disapproved when I read aloud to the family, they thought that this was a very serious idea, and that we need to grind our own meat, complete with lots of accidents for them to clean up. Oh so funny! Thank you for the laugh.